Use Fleet Maintenance Pro to track preventive maintenance and repairs for vehicles and various other kinds of equipment – fork lifts, backhoes, excavators, generators, air compressors, golf carts, and more. Take control, save costs and boost your bottom line! Organize fleet assets and track all the data you need to effectively manage your fleet. Enter an UNLIMITED number of assets ranging from cars, trucks and trailers to heavy construction equipment, machinery, tools and more. Define any number of preventive maintenance tasks to be tracked by date, mileage, kilometers, hours, or fuel consumption. Automated maintenance due notifications are provided on screen, by e-mail, or within comprehensive reports. 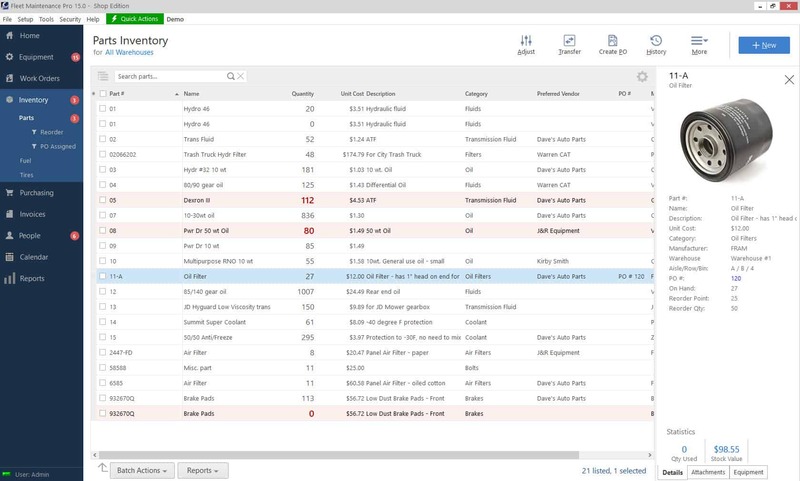 Keep on top of unexpected repairs by logging and tracking repair requests from start to finish. Monitoring the frequency and cost of repairs can also help you decide whether to keep or retire a fleet asset. 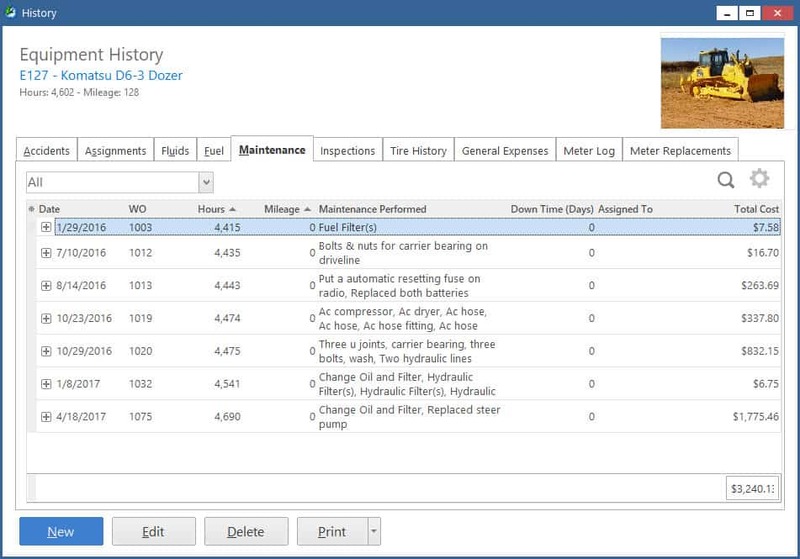 A detailed history of maintenance performed is automatically logged so you can analyze costs. Monitor trends in wear, neglect, and abuse. A thorough maintenance history helps you make effective decisions. Record fuel transactions so you can monitor fuel expenses and economy, catching potential issues with efficiency or abuse. An optional fuel import module can use exported data from your existing fuel card system, saving manual data entry time and effort. Itemize and track usage of your parts when maintenance is performed. 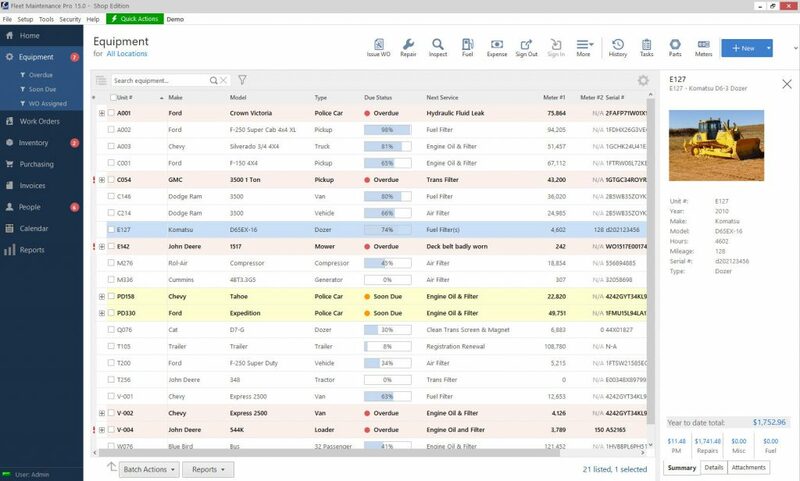 The Shop Edition provides a full inventory management system for stock tracking, reorder notifications, purchasing, and more. 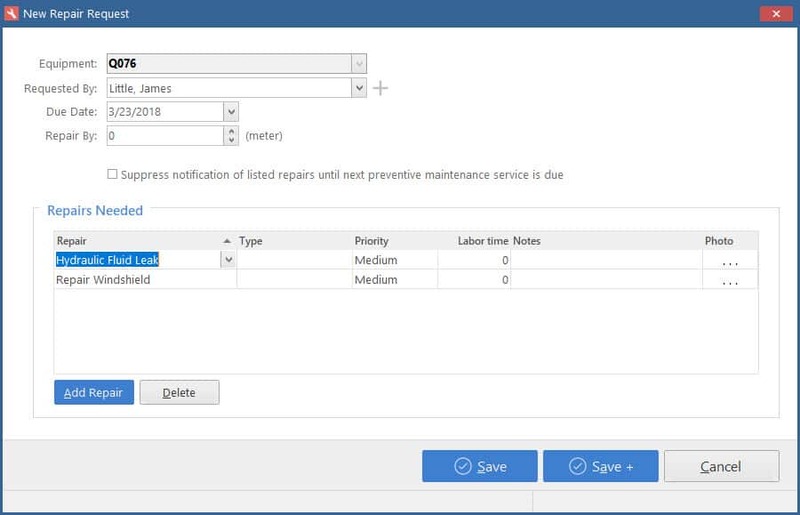 Generate work orders based on preventive maintenance due or repair requests. Monitor your work order's status from beginning to end and easily indicate parts and labor involvement. Print, email, or export from a wide range of reports ranging from simple fleet listing reports to detailed cost analysis reports. Need something specific? 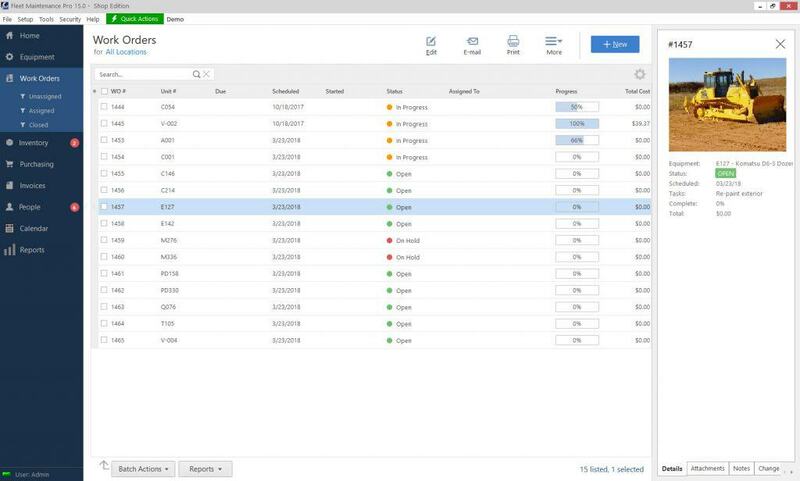 Use the optional report editor to adjust any report to meet your needs. 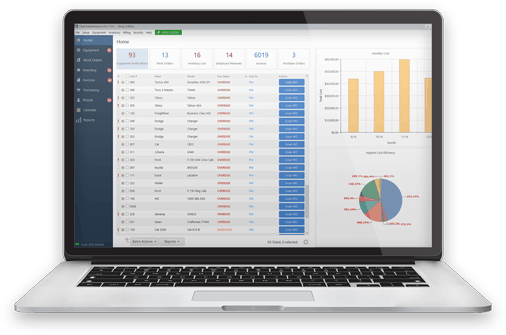 All editions of Fleet Maintenance Pro will track an unlimited number of fleet vehicles and equipment. You can track all of the descriptive details that you need to manage your fleet, including the year, make, model, serial number, and all of the information that is critical to your business. Create custom labels for user-definable fields to store additional equipment facts. You don’t have to be a computer programmer – or hire one – to tailor Fleet Maintenance Pro to meet your needs. 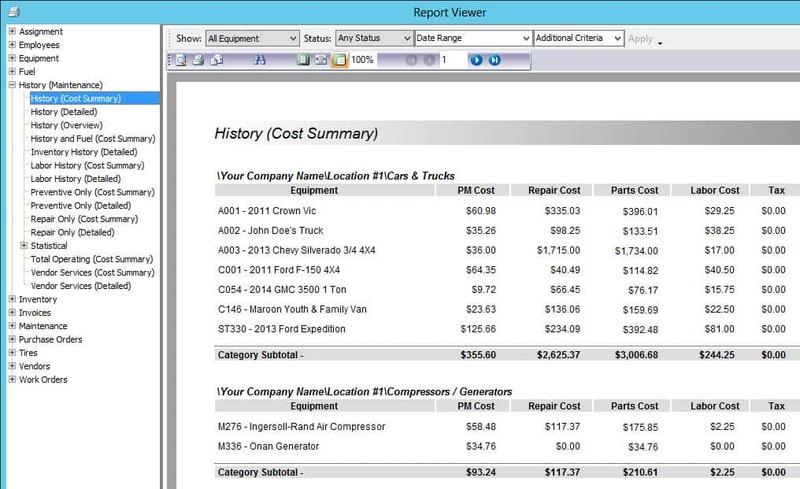 Fleet Maintenance Pro makes it easy to see when assets are due for service. Automated and color-coded preventive maintenance alerts automatically display each time you start the program. Equipment due for service will be shaded red, while equipment soon due will be shaded yellow. You’ll know immediately where your fleet stands at any given time. 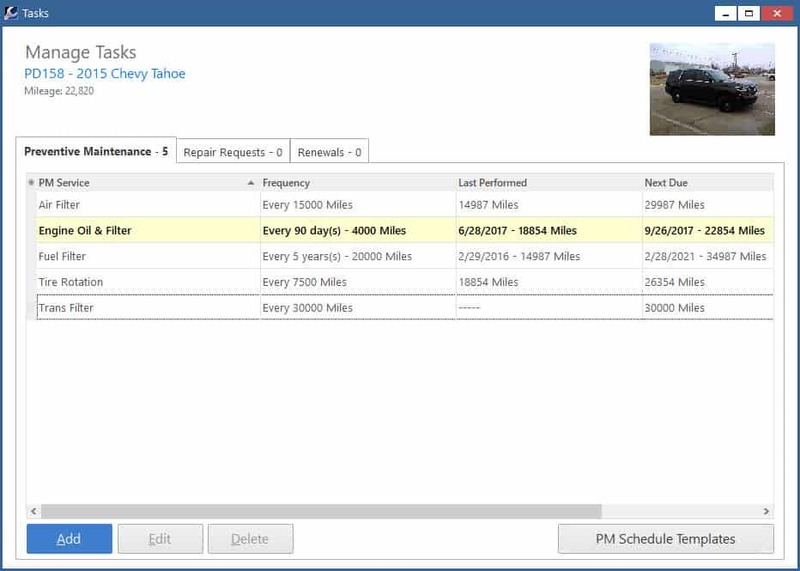 Easily customize your own PM Schedules based on the tracking requirements of your fleet. You can track your PM by date, mileage, hours, or kilometers. Tracking repair maintenance is just as important as tracking preventive maintenance. Monitoring trends in repair maintenance can help you decide whether to keep or retire a vehicle or piece of equipment. Upload a photo and itemize parts and labor costs. 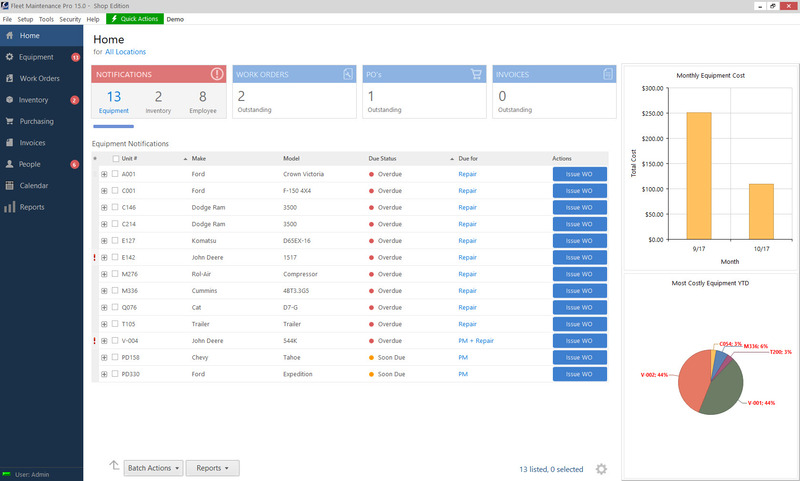 With Fleet Maintenance Pro, your maintenance and repair records are captured automatically. Tracking history is one of the most vital tasks when managing a fleet. Good records can be used to analyze costs and monitor trends in wear, neglect and abuse of your equipment. Historical information can be the determining factor when you decide to keep or retire a vehicle or piece of equipment. Monitoring fuel consumption and economy is also an important part of your job. 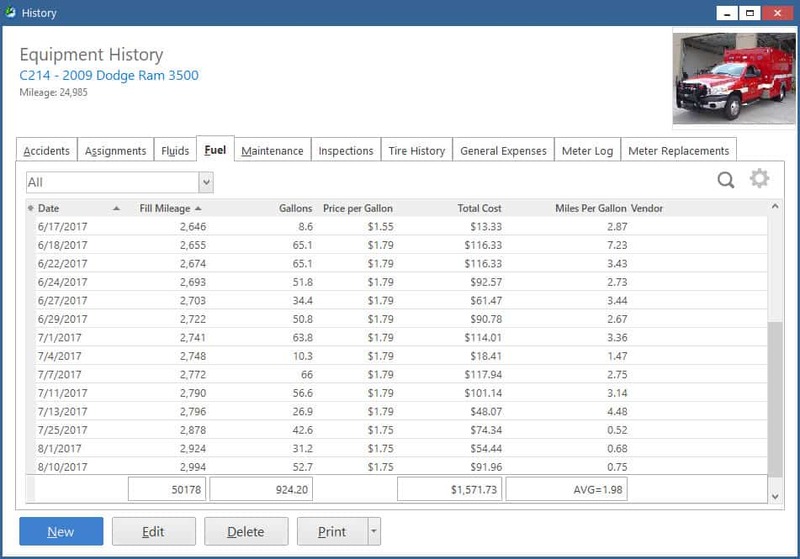 When Fleet Maintenance Pro records fuel transactions, the software performs numerous fuel statistics calculations that show you trends in wear and abuse of your equipment. The software also provides a Fuel Import Utility which will reduce manual data entry as it imports data from your existing fuel card system. In addition to reporting any maintenance that is due, the work order system will generate work orders for each piece of equipment based on this due maintenance. If you’ve configured the software to do so, the parts required to perform the maintenance will also be automatically included on the work order. When the work has been completed, close the work order, and all services pertaining to that work order are automatically updated to history, nearly eliminating manual data entry. Without any tedious paperwork, you’ll also have a comprehensive work order summary, and detailed reports.